The objective of bi-MICS is in creating a ‘smaller’ incision and such can be maximized when used in combination with sutureless vitrectomy. The implantation of the IOL at the end of the vitrectomy provides the best visualization especially of the peripheral retina. 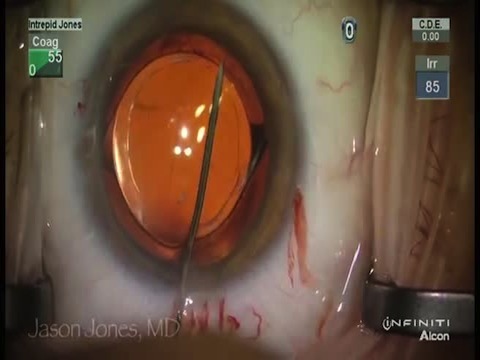 ‘Smaller’ incision sizes have now enabled surgeons to perform ‘Real’ sutureless surgery and combining sutureless MICS and MIVS may currently be the most minimally invasive combined ophthalmologic surgery technique. Suk Ho Byeon, MD, presents a combined sutureless MICS and MIVS case. Sorry for the late reply, If there is no glow or retroillumination due to dense vitreous hemorrhage, extensive fibrovascular membranes, tractional retinal detachments, etc, first of all, you can perform the vitrectomy prior to the cataract surgery until sufficient visualization is attained. Your 2nd option is that if your are accustom to using chandelier illumination this can also enhance the amount of retroillumination during cataract surgery. Your 3rd option is procede with the cataract as is using the Trypan Blue but leave the cortical remnants until after the vitrectomy where then you should have the glow needed to clean up the remaining cortex. Concerning hypotony, this issue has much decreased with evolving wound configurations and our incidences are very low. However, case selection is important as you know younger myopic eyes are much more prone to post- operative hypotony. Even in our few transient cases of low IOP, we fortunately did not experience any choroidal complications. Thank You for your interest ! What would you recommend if there is no glow, as in vitreous hemmorrhage? Trypan Blue for rhexis is okay but for cortical clean up its difficult without glow from behind. Also you did not perform any FAE, what is your incidence of low IOP, choroidals etc. following this combined approach?